Alaska fisherman John Platt still struggles with financial and psychological effects of the 1989 Exxon Valdez oil spill. Cordova, Alaska (CNN) -- For third-generation fisherman John Platt, the 1989 Exxon Valdez oil spill is a financial and psychological nightmare that won't end. Three years after the 11 million-gallon spill in Prince William Sound blackened 1,500 miles of Alaska coastline, the herring on which he and other Cordova fishermen heavily relied disappeared from the area. Platt and some others stuck around, fishing for salmon and hoping things would improve. The herring never returned to Cordova. Platt's income plummeted, severely straining his marriage and psyche. He dipped into his sons' college funds to support his family. "People's lives were ruined," Platt said. "There were damn good fishermen here in the Sound, and they just said, 'Screw it' and left, and tried to make a living elsewhere." As for Platt, who stayed: "I wasted 20 years of my life," he said. Platt and other people in the Alaskan village of about 2,500 people say they still are suffering economically and emotionally 21 years after the oil disaster. About 3,400 miles away, an oil leak that started last month in the Gulf of Mexico is threatening the Gulf Coast. "Here we go again," Platt said of the oil leak in the Gulf. "I feel real bad for the people who are going to potentially go through what we did here." The herring loss alone has cost the region about $400 million over the past 21 years, according to R.J. Kopchak, a former fisherman who is now developmental director at Cordova's Prince William Sound Science Center. The average fisherman suffered a 30 percent loss in income after the spill, but those who specialized in just herring lost everything, Kopchak said. Sociologists who spent years around the Sound after the disaster concluded that a fifth of all the area's commercial fishermen suffered severe anxiety, and as many as 40 percent suffered from severe depression. "People went bankrupt. People lost things," said Mike Webber, a Cordova fisherman. He said perhaps 30 to 40 families have left Cordova since the disaster. Webber, who fished for herring and salmon before the spill and continued fishing for salmon in the years after, said he began drinking heavily after 1989. He then lost his marriage. "I blame my divorce on Exxon -- the oil spill," Webber said. "It was just aggravation and frustration that tore us apart." The surface oil from the spill had largely disappeared within three years of the spill, according to studies conducted by the National Oceanic and Atmospheric Administration's Office of Response and Restoration. But oil residue still can be found on the shore. "It is a lingering problem, as they say, with no easy solution," Kopchak said. Money from Exxon hasn't made the fishermen's problems disappear. Besides the $2.5 billion that Exxon is estimated to have paid for the cleanup, it reportedly paid $300 million soon after the disaster to 11,000 fishermen, fish processors and others affected. In 1994, a federal jury ordered Exxon to pay $5 billion in punitive damages, but appeals reduced that award to $507.5 million. Last year, a federal court ordered Exxon to also pay $470 million in interest on the punitive damages. Platt says he has received about $600,000 from Exxon. 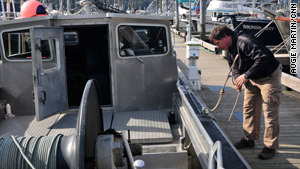 But most of it was used to clear liens on his fishing permits and boats, he said. Before Exxon's successful appeals, fishermen were expecting a lot more, Platt said. "I think the general perception is that we were compensated a long time ago, that everything is rosy. That's not the case," Platt said. Exxon says the spill had nothing to do with the herring disappearance. In a statement, Exxon said the herring catches were outstanding for the first three years after the spill, and that scientific studies showed that the subsequent decline was caused in part by ocean factors that led to poor nutrition, and perhaps by disease. Other studies, Exxon said, pointed to competitive interactions between young herring and young salmon, and to predators. "The Valdez oil spill was a tragic accident and one which ExxonMobil deeply regrets," Exxon said in a separate statement. "We took immediate responsibility for the spill and have spent over $4.3 billion as a result of the accident, including compensatory payments, cleanup payments, settlements and fines." "As a result of the accident, Exxon undertook significant operational reforms and implemented an exceptionally thorough operational management system to prevent future incidents. ExxonMobil has a long history of community support throughout Alaska and we continue to expand that focus," the statement said. For Platt, the nightmare continues. "We got hosed here in Cordova, and nobody cares," Platt said. CNN's Jason Hanna and Steve Almasy contributed to this report.